Although Panerai has a long history of making watches, Panerai watches have only been available to the public for a few decades. That’s because Panerai watches were once exclusively built as military dive watches for the Italian (and other nations) Navy. Today, Panerai watches, particularly the Panerai Luminor, are some of the most recognizable and sought-after men’s luxury watches. Let’s briefly explore the history of Panerai, how the Panerai Luminor claimed its iconic status, and discover four different versions of the famous timepiece. Founded in 1860 by Giovanni Panerai in Florence, Italy, the Panerai brand boasts an interesting history that spans over 150 years. A significant part of Panerai’s heritage was being an official supplier of dive watches to the Italian frogmen during World War II. To meet the specific needs of the military divers, Panerai developed the Radiomir watch. Sporting a large cushion-shaped waterproof case, a dark dial with highly luminescent markings, a hand-wound mechanical movement developed by Rolex, and long waterproof straps, Panerai built the Radiomir watch for underwater use. The design of the Panerai Luminor came around in 1950, with its signature oversized crown protector bridge. However, the watch only became officially known (and available to the public) as the Panerai Luminor in 1993. 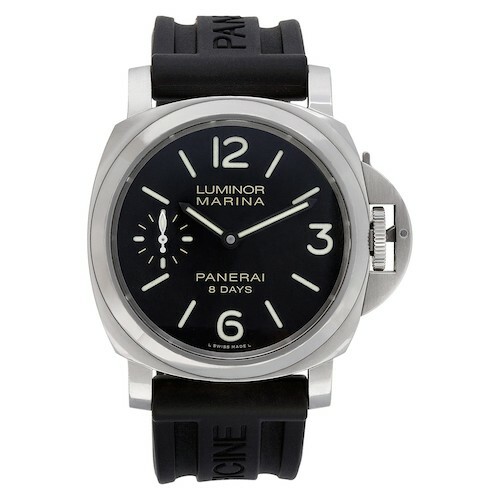 Although the Radiomir came first, it’s the Luminor with the oversized crown guard that stands out as Panerai’s icon. Let’s take a look at some different versions of the Panerai Luminor watch. 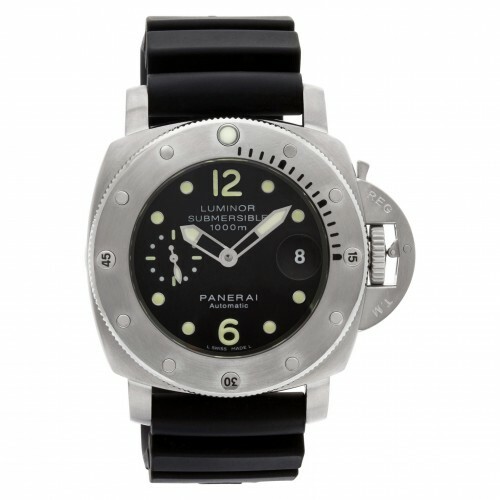 Released in 2002 as a limited edition model, the Panerai Luminor 1950 “Fiddy” ref. PAM00127 caused some major waved in the luxury watch space with its massive 47mm case size–made even bigger thanks to the protruding lever-operated crown guard. As its name suggests, this was Panerai’s tribute to that original 1950 case design that started it all and the model is limited to just 1950 pieces. On the black dial, there’s the familiar mix of Arabic numerals at 3, 6, 9, and 12 o’clock, along with stick indexes. Plus, accompanying the luminous center hour and minute hands is the running seconds indicator at 9 o’clock. Flip the stainless steel case around and you’ll see the manual-wound mechanical movement heavily decorated with the Panerai logo. 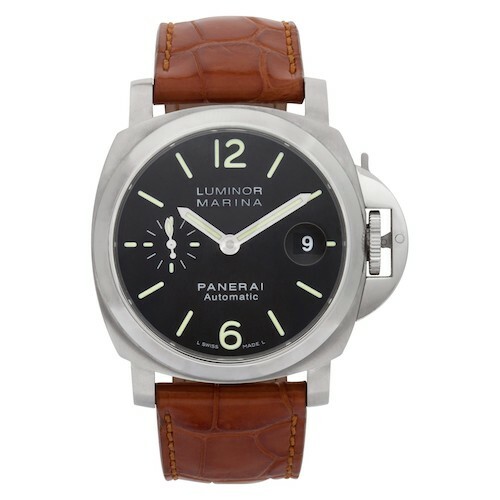 Significantly smaller than the previous model, the Panerai Luminor Marina ref. PAM00048 has a 40mm steel case. Housed within that case is the classic black Panerai dial with the Arabic numerals and stick indexes, however, there is also the addition of a date window at 3 o’clock. Fun fact, when the Luminor is joined with the “Marina” label, that indicates the presence of the running seconds subdial at 9 o’clock. 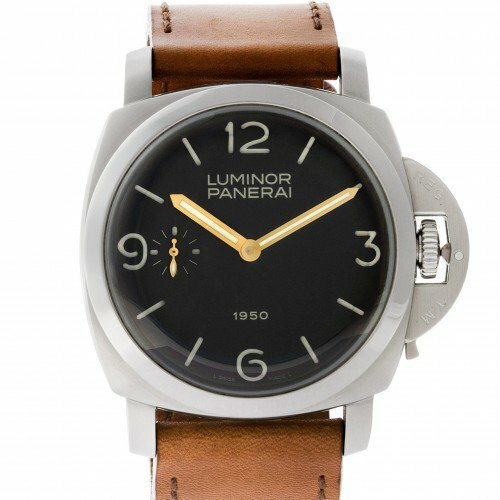 Another detail worth noting is that the PAM00048 is an automatic Panerai Luminor rather than the more common manual-wound versions. Waterproof to 300 meters, the Luminor PAM00048 protects the OP 6690 automatic movement with a solid steel caseback. At the heart of the Panerai Luminor Marina PAM00510 is a hand-wound caliber that provides the watch with eight days of power reserve! More than a week can go by before you have to wind this particular Panerai watch. Although that’s certainly impressive, it’s not new for Panerai. In fact, as early as the 1940s/1950s, Panerai already had eight-day power reserve timepieces and this is the modern version of those vintage Panerai watches. The P.5000 hand-wound mechanical movement is encased within a 44mm steel Luminor case, while the dial is classic Panerai with its luminescent oversized details and stark aesthetic. Furthermore, rather than a leather band, this PAM00510 comes with a sporty black rubber strap proudly flaunting the Panerai logo. The watch’s 300 meter water resistance coupled with the waterproof strap makes it an ideal companion for some major fun in the sun and sea this summer. Although Panerai Luminor watches draw their inspiration directly from diving watches for the Italian Navy, by today’s standards, they’re not considered diving watches due to the lack of dive bezel. However, the Luminor Submersible watches are Panerai’s diving watches, equipped with unidirectional bezels marked to 60 minutes. Water resistant to 1000 meters and fitted with a Helium Escape Valve, the automatic Panerai Luminor 1950 Submersible PAM00243 is built to go diving. The 44mm steel case has the curvier “Luminor 1950s” case silhouette but is much bulkier of course to accommodate the HEV and to be able to withstand the pressure when diving. To further meet the specific demands of divers, the PAM00243 comes with an accordion-style waterproof rubber strap for optimal flexibility. What’s more, the presentation box comes with an additional fabric strap and all the tools needed to make strap-switching a breeze. Whether you go for a manual or automatic version, a dressier Luminor Marina style or the more robust Luminor Submersible diving watch, the appeal of the unique Panerai Luminor is undeniable.